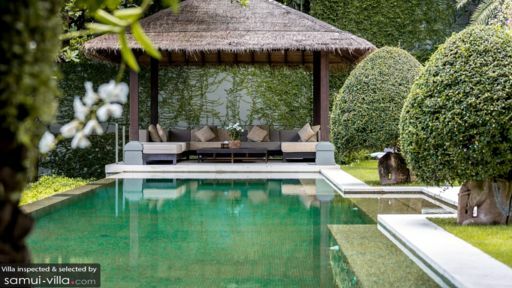 A stunning property as part of the Sangsuri Estate in Chaweng, Samui, Sangsuri Villa 3 is a sprawling property with six bedrooms and a dormitory ideal for kids and young adults. With a contemporary and swanky décor/ interior, the villa features landscaped gardens, swimming pools, Jacuzzi, and a multitude of amenities to keep guests entertained. The villa is equipped to give guests the time of their lives with everything they could ever wish for. Located in Chaweng puts guests at an advantage, as they are close to all the action in the area! The upper-most level at Sangsuri Villa 3 has three bedrooms, one of which leads to a garden terrace and the other two are bordered by pebbled, water features. The pool level holds the master bedroom which has direct access to the infinity pool and its own Jacuzzi, as well as the dormitory which is equipped to serve 6 children. The rooms are well-furnished with king beds and are designed to provide a restful night’s sleep. The remaining bedrooms are also furnished with king bed or twin bed and provide great views of the neighboring areas and the ocean. Each of the bedrooms has an air-conditioner, and they have en-suite bathrooms. Sangsuri Villa 3 has two levels, namely, beach level and pool level, each of them staying true to its name offering you just that. 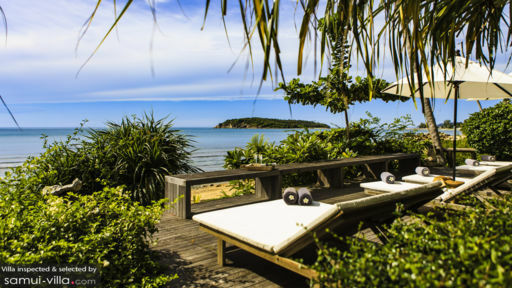 The beach level leads to the sandy shores of the Samui beaches, so you can play in the sand, sunbathe on the sunbeds as you observe the ocean, or simply relax under the tropical sun. There is a wooden bridge that leads to a Jacuzzi from the beach as well as a massage sala. The pool level, on the other hand, leads to a 23-metre infinity swimming pool as well as a pool sala. The landscaped tropical gardens are home to some of the most beautiful trees and plants, that accentuate the natural ambiance of the entire villa. 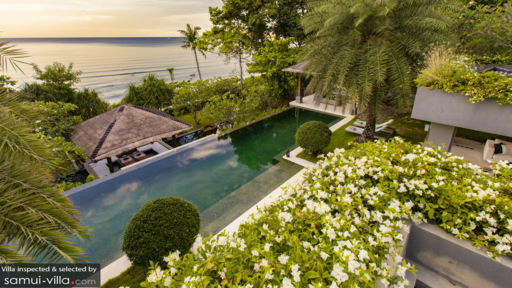 Housed under a separate pavilion that sits facing the infinity pool and the ocean in the distance, the lavish living area of Sangsuri Villa 3 is found on the first level. Its open-plan concept maintains a well-ventilated, and well-lit room for guests to gather and enjoy themselves. The room is furnished with comfortable white couches, with pin-striped cushions and such for a nice, modern touch to an otherwise naturally exclusive destination. An AV/TV room is where you will find plush couches and a flat-screen TV for a fun movie experience. You can see the lotus ponds right from where you are! The neighboring pavilion at the villa is home to the dining area and kitchen. There is a multi-purpose room is this pavilion which can be used as additional dining space or for other things like a breakfast corner, buffet-setup, cocktail bar. The fully-equipped kitchen is where the house chef will prepare delicious meals for guests! The villa estate offers a multi-purpose gym for the use of guests from all the villas. The staff is friendly and there is daily housekeeping of the villas. There is the massage sala and BBQ which the staff can prepare. They are there to look after your needs with care and to ensure you have a wonderful stay at Sangsuri Estate. Guests of Sangsuri Estate could not be at a better location as Chaweng beach is known for its famous restaurants, beach bars, and cafes. There are ample things to do around the area, including visiting the Choeng Mon beach and Night Market for a taste of the local life. There is the Art Samui Museum with its 3D optical illusions as well!